Did I hear correctly that it's being released on DVD on Monday. Haven't bought a DVD in years but will certainly be buying this one. Interview on BBC radio 5 Live at the moment in an hour long special. I watch this most Sundays, will defo watch this Sunday. Anyone watch the DVD yet? Yeah I watched it on Monday, really enjoyed it but to be fair there wasn't a lot they could have done that I wouldn't have enjoyed given the subject. Had never heard of this C4 show until last week. Glad I taped it as I could skip the bits of no interest. Could not believe that it is a weekly 2 1/2 show. Looking forward to getting to watch the DVD. Watched the film last night, very good, hard to see the man get emotional talking about Hillsborough. Powerful bit when he's walking up the road/hill and looking out at the view when he gets to the top. Titles?We don’t need no stinking titles. Gerry and Niall like this. So is that "King Sir Kenny" or "Sir King Kenny"? honald_tdb and bobby benitez like this. It never bothered me that he was denied this recognition for all of those years.To me and I'm sure to him too,the esteem he was held in by so many was far more important and I did wonder if he'd accept it if it was offered.But he seems genuinely proud to have received this honour,and if it makes him proud then I'm very happy for him to have it. With all he's done for so many people,nobody should begrudge him this for himself and his family.I know some would have liked him to make a stand against the British establishment and turn it down,but he's stood up for the people of Liverpool so many times and will continue to do so for the rest of his life so congratulations Sir Kenny. A great footballer but always more importantly,a great man. south, Mico, Roll on 19 and 4 others like this. I've no problem with him accepting the award, he's earned all the recognition and appreciation that he gets (and probably a lot more again). NoName7, Skintown Red, mushypea and 6 others like this. Sir Kenny Dalglish took a look at the newly-updated stand named in his honour today, following the summer announcement of his knighthood. The former Centenary Stand at Anfield was officially renamed after the Liverpool legend last October, in recognition of his remarkable contribution to the club as a player, manager and guardian on and off the pitch. But the news of further acknowledgement of Dalglish’s services to football, in the form of a knighthood in the Queen’s Birthday Honours list, came in June. 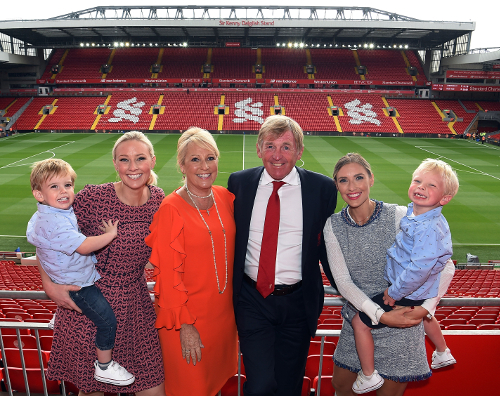 So, an addition to the signage at the top of the Kenny Dalglish Stand was required – and the man himself, along with some of his family, saw it up close before kick-off against West Ham United. NoName7 and honald_tdb like this. I came across this earlier, Bob Paisley and Kenny's first interview after the transfer from Celtic.